For car interiors and furniture made of natural leather of all kinds (except of Astrakhan - lamb leather) and of velour. The cleaner is of high efficiency. 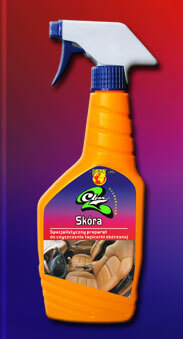 It removes most stains from the your car’s seats, conditions the material and protects against new stains. The liquid has conditioning effect on leather - it preserves its elasticity. It regains leather’s original colour and preserves it and makes it more water resistant.